Based in Canada, the client, Winsoft Technology , has been developing creative and practical software solution for over 21 years. They have successfully developed over 20 applications for their international clients in the past two decades. The client aimed to create a platform for Entity Management Application (EMA). The platform will combine the concepts of Family Office applications, CRM applications and provide a relationship between all entities. Choosing Silverlight as the presentation layer, not only because it provides compelling Cross-Platform user experiences, but also because it provides the ability to create an excellent UI which definitely matters to customers, furthermore, it provides flexible programming model with collaboration tools which highly improves the effectiveness. MVVM is specially designed for WPF and Silverlight. Besides, it sets up several development standards: the program should be feasible to unit testing, easy to maintain and of a high readability. 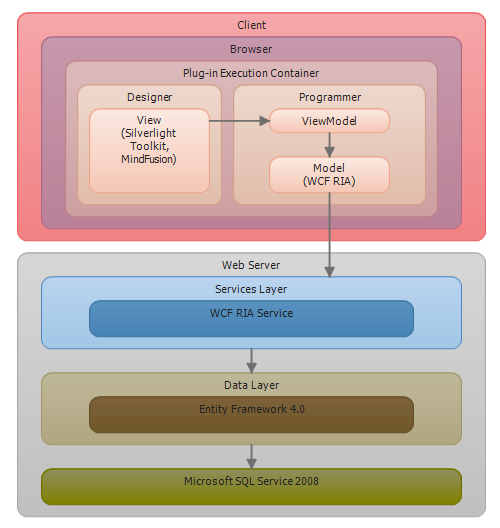 Microsoft WCF RIA Services is aimed to simplify the traditional n-tier application pattern by bringing together the ASP.NET and Silverlight platform. The adoption of this technology will largely improve our efficiency to develop a data based application. Concerning the attraction of the UI as well as the productivity, we took advantage of the control – Silverlight Toolkit and MindFusion, which will save the development time without sacrificing the elegance of the UI. The requirements provided by the client were rough, there were lots of details uncovered. In order to let our client got the product as soon as possible, we took the agile approach to develop this product. First, we work out a work item list and let the client determine the priority of each work item. Then we made a rough weekly plan commenced to develop the work item according to the priority. We sent daily work report to let the customer know our progress and what's going on here. We also sent weekly report to summarize the functions completed in that week and the detail plan of next week. We delivered a new release every week, then the client would take a look at the new release and give some feedback to us, and we would do some necessary adjustment according to the feedback. All functionalities were gradually carried out step by step, week by week in a proven and solid way. When we had questions about the requirements, we sent emails or discussed them via Skype in advance. When it came to the UI, we always provided sketches for the client to confirm before we got down to work. Due to proactive and timely communications, the development process has been under control and the product was successfully published. The client gained more clients and successfully increased the market share with the attractive application. Due to cost advantage of Nova compared with local development company, the client saved 60% on development cost.